Faro City is the administrative center of the Faro District which coincides with the Algarve Region, and an area of Europe that has been settled and fought over for thousands of years because of its strategic position and beautiful countryside. The capital of the Algarve has a distinctly Portuguese feel despite it also being a resort town, which makes it great to explore by Faro motorhome rental, campervan hire or RV rentals in the Algarve. A great first stop in your Faro motorhome rental include the historic old town quarter, attractive marina, and plazas dotted with outdoor cafes, restaurants, churches, and trendy nightlife spots. Faro’s reputation as an overrun party beach town littered with campsites for travelers in campervan hire or RV rentals belies a layered past. The city has more history on every street than in most cities in Europe. The Moors ruled this area of Europe for centuries and their influence can be seen today in the architecture of the buildings and the mosaic sidewalks. The churches built by Catholicism are some of the most fantastic examples of architecture in the Iberian Peninsula. The most ghoulish of the attractions is the 19th-century Capela dos Ossos, a chapel built out of the bones of over 1,000 monks in order to convey the notion of earthly impermanence. A tour in your Faro motorhome rental can take you to the beaches, Praia de Faro, where you can soak up the sun or try some adventure sports like windsurfing. In nearby Estoi, you can see Roman ruins, and get a better understanding of Portugal’s history. A short drive away in your campervan rental in Faro and you will come upon Albufeira, a Moors influenced cliffside fishing town now known for its beaches and nightlife. 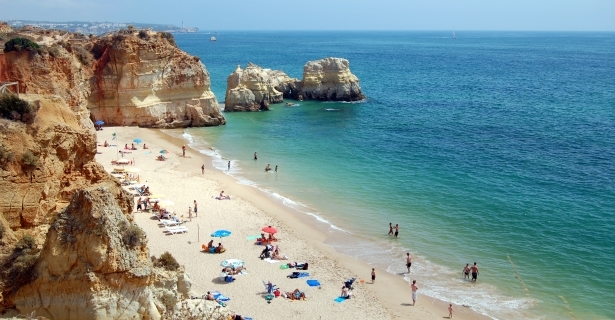 In general, the beaches in the Algarve region – more than 100 of them with a combined coastline of 200 kilometers – are known to be some of the cleanest and loveliest in Europe and it will feel almost like you are on another continent when you see the dunes and shell covered beaches up and down the coast. Once you are done with the beaches and the history of the medieval old town then it will be time to head out in your RV rental in Faro to the hiking tracks and biking trails that offer up great views of rolling hillsides overlooking quaint villages and ancient ruins scattered all throughout Algarve. On top of it all, Algarve is balm to the nature-deprived. Best accessed by campervan hire in Faro, the lagoons of the Parque Natural da Ria Formosa, islands of Ilha de Faro, and Ilha de Barreta to the southwest highlight the natural wonders that Faro has to offer. Parque Natural da Ria Formosa, in particular, is an excellent birding site, and Quinta do Lago within the park grounds is one of Europe’s most happening golfing resorts.